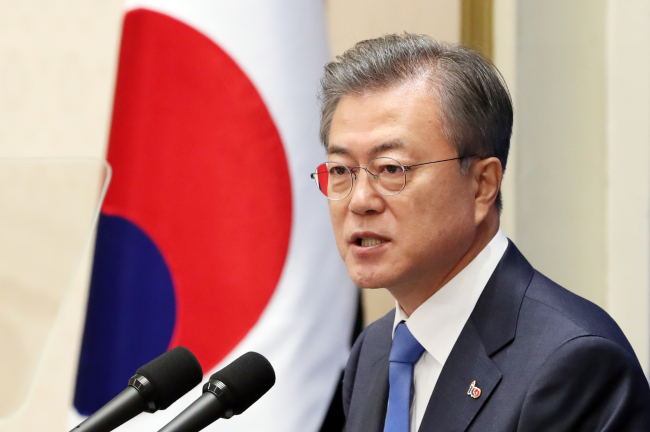 South Korean President Moon Jae-in will embark on a three-nation Asian tour next week that will take him to Brunei, Malaysia and Cambodia, his office Cheong Wa Dae said Monday. The president will leave the country on Sunday for Brunei, where he will make a three-day visit for a summit with Sultan Hassanal Bolkiah. Moon's trip comes amid his efforts to greatly improve his country’s relationship with the Association of Southeast Asian Nations (ASEAN) members. “President Moon will discuss ways to successfully hold a special South Korea-ASEAN summit with Brunei and promote South Korea-ASEAN cooperation,” Cheong Wa Dae said in a press release. Seoul earlier proposed hosting a special summit with ASEAN, which is expected to be held later in the year. The South Korean leader has also promised to visit the 10 member countries of ASEAN before his five-year term ends in 2022. Moon will leave Brunei on March 12 and head for Malaysia, where he will hold a summit with Sultan Abdullah of Pahang and hold talks with Prime Minister Mahathir Mohamad on ways to further improve the countries‘ bilateral relations. Moon’s trip will end in Cambodia, also a member of ASEAN along with Brunei and Malaysia. In Cambodia, the South Korean president will hold a summit with Prime Minister Hun Sen to discuss ways to enhance bilateral cooperation and promote joint prosperity, the press release said.